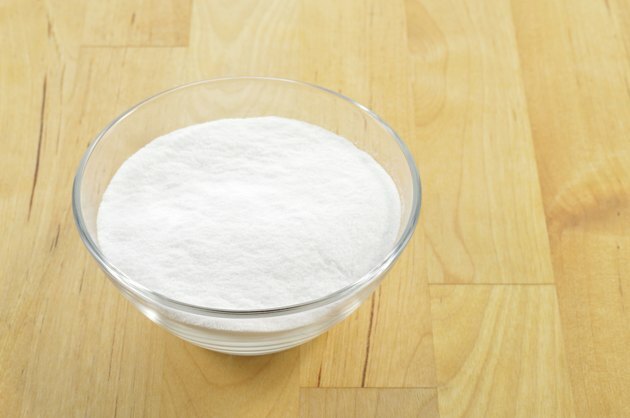 Sodium bicarbonate, commonly called baking soda, is an effective antacid. Antacids are good for relieving occasional heartburn and indigestion because they absorb and neutralize stomach acid. In addition, some health conditions may warrant taking sodium bicarbonate to lower the acidity of the blood and urine and to lower high potassium levels, explains Drugs.com. Consult a qualified health care provider before beginning to take sodium bicarbonate for any health purposes, because the substance is associated with some dangerous side effects. Taking sodium bicarbonate involves consuming a large amount of sodium, which can elevate blood pressure, aggravate heart disease and lead to edema, or swelling of the legs and feet due to fluid retention, according to Jackson Siegelbaum Gastroenterology. Anyone on a sodium-restricted diet and people with high blood pressure, cardiovascular disease or kidney disease should not take sodium bicarbonate. In addition, because edema is relatively common during pregnancy, pregnant women should not take sodium bicarbonate. Because sodium bicarbonate lowers potassium, it can cause abnormally low potassium levels in some people, as noted by KidsHealth. Symptoms of low potassium include confusion, fatigue, weakness, faintness, numb or tingling sensations, muscle cramps, constipation, vomiting and a rapid heartbeat. Very low potassium can cause an irregular heart rhythm. Taking a potassium supplement to counteract low potassium is generally not advisable without medical supervision, because high potassium levels also can cause heart complications. High potassium levels are more dangerous than low potassium levels, according to the Merck Manual of Health and Aging. Some athletes drink a large amount of sodium bicarbonate before an event, a practice known as soda loading. A prevailing theory holds that soda loading can delay fatigue during anaerobic exercise. Anaerobic energy production is essential for short bursts of stamina, such as the final seconds of a sprint, but it increases the acidity inside muscle cells, which can lead to fatigue. Because sodium bicarbonate is alkaline, it decreases blood acidity, which then draws acid from the muscles. Research results on the benefits of this practice are conflicting, according to Peak Performance, which may be due to some athletes developing side effects from sodium bicarbonate. The U.S. National Institutes of Health explains at its MedlinePlus website that soda loading can be dangerous, with side effects of diarrhea, vomiting, muscle spasms, muscle weakness and even seizures.